Escape Game Abandoned Cemetery 5nGames info about the game-Games2Rule. Assume that you went to visit the tomb of your relative which is in an abandoned cemetery. After paying homage to the deceased, you wanted to get back home but you are stuck inside the cemetery as the gate got locked on its own. You now need to find a solution to escape from the cemetery. 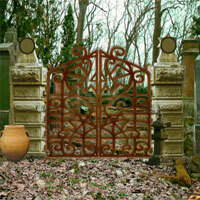 Try to open the gate by finding the missing parts and solving puzzles. Have fun!